Jean-Luc Dehaene (Dutch: [ʒɑ̃ːˈlyk dəˈɦaːnə]; 7 August 1940 – 15 May 2014) was a Belgian politician who served as Prime Minister of Belgium from 1992 until 1999. During his political career, he was nicknamed "The Plumber" and "The Minesweeper" for his ability to negotiate political deadlocks. A member of the Christen-Democratisch en Vlaams (CD&V) party and its antecedents, Dehaene gained his first ministerial appointment in 1981. Dehaene's first government (1992–1995) included both Christian and Social Democrats and presided over the creation of a new constitution, effectively transforming Belgium into a federal state. His second government (1995–1999) coincided with a number of crises in Belgium including the Dutroux scandal. The Dioxin Affair, occurring shortly before the 1999 election, led to a swing against the major parties and Dehaene's government fell. Following his final term as Prime Minister he was active in both Belgian and European politics. He was also on UEFA's financial fair play regulatory body and managed Dexia Bank during the financial crisis. Dehaene holds the distinction of being the last prime minister of King Baudouin's reign. Dehaene was born on 7 August 1940 in Montpellier, France, when his parents were fleeing the advance of the German army into Belgium and France. During his studies at the Université de Namur and the Katholieke Universiteit Leuven, he was a member of the Olivaint Conference of Belgium. He got into politics through the Algemeen Christelijk Werknemersverbond (General Christian Workers' Union; ACW), a trade union which was closely linked to the Christelijke Volkspartij (Christian People's Party; CVP). Dehaene's long-time wife Celie Verbeke is a native of Illinois in the United States but both her paternal and maternal grandparents were Belgian immigrants. Since she was raised by her parents in Dutch and speaks without a foreign accent, the Belgian public remained unaware of her American background for a long time. Dehaene was a keen football fan, and viewed it as an important part of Belgian national identity. He was a supporter of Club Brugge K.V.. In 1981, he became Minister of Social Affairs and Institutional Reform, until 1988, when he became Deputy Prime Minister and Minister of Communications and Institutional Reform. In 1992, after both Guy Verhofstadt and Melchior Wathelet had failed, Dehaene managed to form a governing coalition of Christian Democrats and Social Democrats. This became one of Belgium's most important governments, because it successfully transformed Belgium into a federal state in 1993. In March 1993, Dehaene offered the King the resignation of his government, because of diverging views on how to handle the public finances. However, within a week the differences were put aside. After the death of King Baudouin on 31 July 1993, Dehaene's government exercised the royal function until Prince Albert was sworn in as King Albert II nine days later. In 1994, Dehaene ordered the unilateral withdrawal of Belgian troops from Rwanda following the massacre of a number of Belgian peacekeepers, thus lifting the last barrier to the genocide of Tutsis. During questions from the Belgian parliamentary commission into this decision he repeatedly acknowledged no regrets about the decision. He was the leading candidate to replace Jacques Delors as President of the European Commission, but British Prime Minister John Major vetoed the appointment. The Luxembourg Prime Minister Jacques Santer was appointed as a compromise candidate instead. Dehaene's second government was also composed of Christian Democrats and Social Democrats. Despite the fact that the government was marked by a number of political crises and scandals, most notably the Dutroux affair, it managed to serve the entire legislature. During this period, for his work toward a unified Europe, Dehaene received the Vision for Europe Award in 1996. Dehaene led Belgium into the Euro, and in preparation for joining the Eurozone, the Dehaene government was forced to make some sharp and unpopular economic reforms. Some weeks before the 1999 elections a food scandal erupted, and both governing parties lost much of their support. He was replaced a new government, led by Guy Verhofstadt. Between 2000 and 2007, he sat as Burgemeester (mayor) of Vilvoorde. At the request of his party, the CD&V, he was once again put up as a candidate during the 2003 elections, but this was clearly not with the intention of becoming Prime Minister as he was put as last person on the party list. 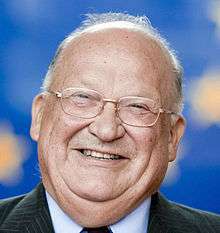 In June 2004 and again in June 2009, Jean-Luc Dehaene was elected to the European Parliament for the CD&V within the center-right European People's Party (EPP) group. In 2003, he was awarded the Vlerick Award. After the Belgian elections of 2007, Dehaene was appointed as mediator in the process to form a new government. He was also called in to assist in the negotiations around the Brussels-Halle-Vilvoorde partition. Dehaene also served as the chief enforcer of the football association, UEFA's, Financial Fair Play (FFP). In 2011, he was involved in an investigation of Manchester City over sponsorship irregularities. In October 2008 Dehaene, who had previously been director of InBev, became chairman of Dexia Bank, a Belgian-French bank. With the bank in problems due to the financial crisis, he was asked to lead the company through the difficult period which he described as "mission impossible". Because he has an extensive political background it was thought that he could cope with the negative perception of the financial institution Dexia due to the financial crisis. His political connections helped Dexia's bad bank to secure funding guarantees of up to €90 billion provided primarily by the Belgian government. In 2012, Dexia Belgium became Belfius. On 15 May 2014, Dehaene died after a fall while holidaying in Quimper in France. He had been diagnosed with pancreatic cancer earlier the same year and was not seeking reelection as a MEP in the 2014 elections for health reasons. He was 73 years old. In the aftermath of his death, he received tributes from the incumbent Belgian Prime Minister Elio Di Rupo who described him as an "exceptional statesman". Tributes were also made by Guy Verhofstadt, President of the European Parliament Martin Schulz and President of the European Commission José Manuel Barroso. His body lay in state in Vilvoorde's town hall and the retired King Albert II and the Flemish Minister-President Kris Peeters both visited Vilvoorde to pay their respects. Belgium: Minister of State, by Royal Decree. Belgium: Grand Cross of the Order of the Crown. Germany: Grand Cross in the Order of Merit of the Federal Republic of Germany. Sleutels voor morgen, Esopus, Hasselt, 1995, 111 p.
Sporen naar 2000, Icarus, Antwerp, 1999, 173 p.
Er is nog leven na de 16, Van Halewyck, Leuven, 2002, 208 p.
De Europese Uitdaging: van uitbreiding tot integratie, Van Halewyck, Leuven, 2004, 237 p.
↑ "Obituary: Jean-Luc Dehaene". The Guardian. 16 May 2014. Retrieved 2014-05-15. 1 2 3 4 5 6 N.C. (15 May 2014). "Jean-Luc Dehaene est décédé". Le Soir. Retrieved 15 May 2014. 1 2 3 4 5 6 7 Neuger, James G. (May 15, 2014). "Jean-Luc Dehaene, Who Led Belgium Into Euro Region, Dies at 73". Bloomburg. Retrieved 15 May 2014. 1 2 "Jean Luc Dehaene - CVP". Official profiles. Senate.be. Retrieved 15 May 2014. 1 2 3 "Belgium profile". BBC. Retrieved 16 May 2014. ↑ Belga (16 May 2014). "Bplus: "Dehaene was architect van het federale België"". De Morgen. Retrieved 16 May 2014. ↑ Reuters (25 May 2007). "Belgian guilt examined at Rwanda genocide trial". One India. Retrieved 16 May 2014. ↑ "Angela Merkel to receive Edmond Israel Foundation's Vision for Europe Award". Clearstream. 6 November 2006. Retrieved 16 May 2014. ↑ Belga (15 May 2014). "Groot staatsman die België in de Eurozone leidde". De Morgen. Retrieved 16 May 2014. 1 2 3 4 5 6 Kroet, Cynthia (15 May 2014). "Jean-Luc Dehaene, giant of Belgian politics, dies". European Voice. Retrieved 16 May 2014. ↑ "Jean-Luc Dehaene krijgt Vlerick Award". De Tijd. 26 April 2003. Retrieved 16 May 2014. ↑ "The Belgian plumber is back". 5 July 2007. Retrieved 5 July 2007. 1 2 "Uefa boss to scrutinise Manchester City's Etihad deal". BBC News. 16 August 2011. Retrieved 16 August 2011. ↑ Verschueren, Rogier (15 May 2014). "Jean-Luc Dehaene overleden". De Standaard. Retrieved 15 May 2014. ↑ AP (15 May 2014). "Former Belgian Premier Jean-Luc Dehaene is dead at 73; helped set up EU constitution". Fox News. Retrieved 16 May 2014. ↑ Belga (22 May 2014). "Le Roi Albert et la Reine Paola rendent hommage à Jean-Luc Dehaene". La Libre Belgique. Retrieved 22 May 2014. Wikimedia Commons has media related to Jean-Luc Dehaene.